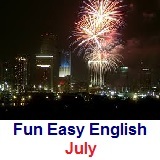 ﻿ Fun Easy English - new classroom free online classes english language lessons speaking listening writing reading july. This month celebrate an important American holiday, Independence Day. Learn all about this holiday with fun lessons and activities. 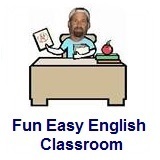 Grammar focus is on adjectives.